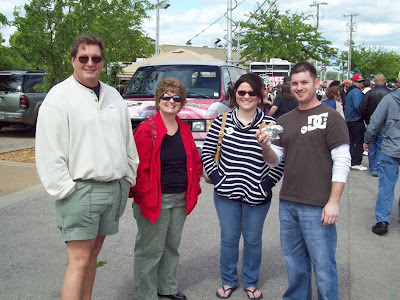 Every second weekend in May, Lady Suzanne's and Sir Lance's hometown of Owensboro, Kentucky "springs to life" with the wonderful smells and sounds of the International Bar-B-Q Festival. Hickory-fired smoke blends with the aromas of roasting chicken, mutton, and pork. About 10 major teams (mostly churches) compete for "the best." 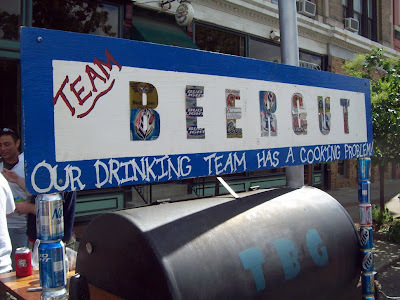 Each team cooks around 1,200 lbs. of mutton, 1,000 lbs. of pork, 500 lbs. 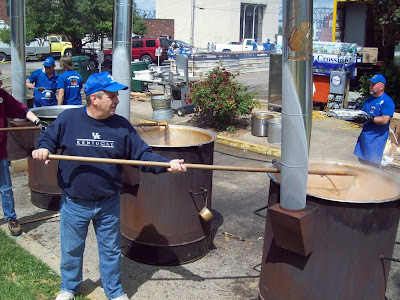 of chicken, and 300 gallons of burgoo -- a sort of spicy Bar-B-Q stew with vegetables. 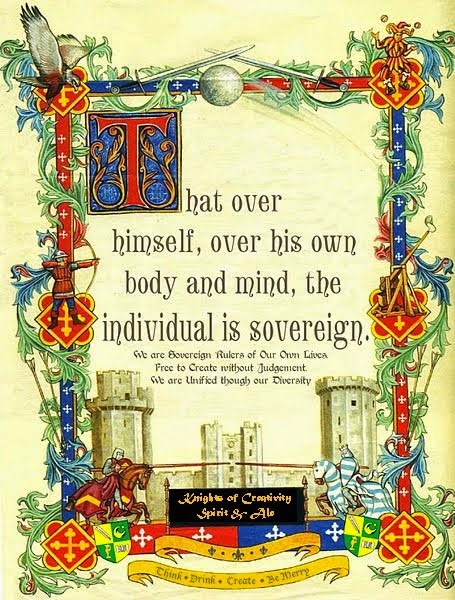 Combine all that with a festival atmosphere and you've got yourself one must-do Knights event. It just so happened that this year Lady Lucy, Sir Lance and his son(yet-to-be-officially named Sir Brian of ? ), Lance's wife Julie, and daughter Jordon came in to town to celebrate Lady Suz's mother's 80th birthday. We were off to the Ohio River riverfront. 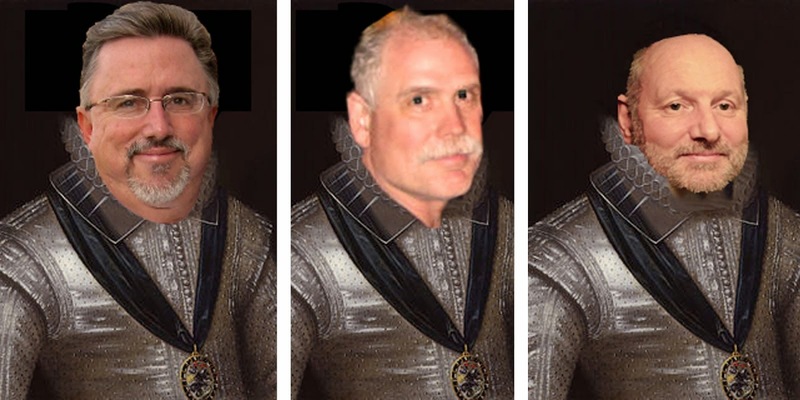 Sir Lance, Lady Suzanne, Lady Lucy, and our newest Knight, Sir ? or ? with a mutton sandwich. 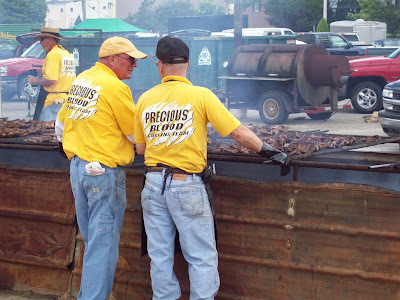 One of my favorite names (A Catholic Church) Precious Blood Bar-B-Q. 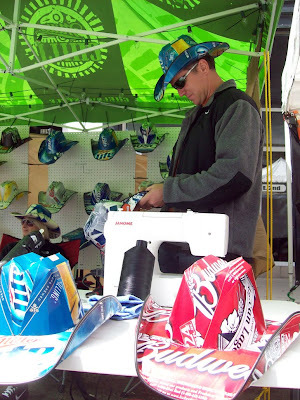 In addition to all the Bar-B-Q smoking, we also enjoyed walking the festival setting and trinket booths which, to my surprise, included a man making cowboy hats out of cardboard beer packaging: (at $30, these were a little outside my frugal budget). This was one of the smaller "backyard" teams. Can you believe it, their Bar-B-Q didn't win any ribbons! 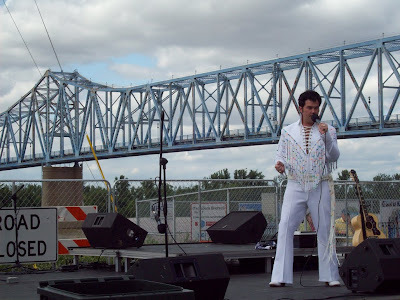 Any U.S. festival wouldn't be complete without an Elvis impersonator. 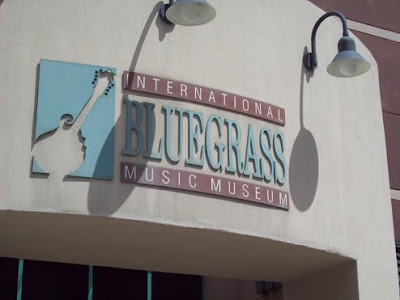 In the background is the famous blue bridge that connects Indiana and Owensboro, Ky.
Owensboro is also home of the Bluegrass Music Museum. 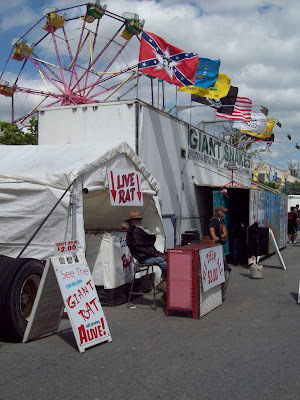 The street festival came complete with a booth to "See the Giant Rat Alive -- over 100 lbs" and Giant Snakes. Note the Confederate Flag -- yes, Owensboro is in the South. More to follow, including a beer tasting event held in Betty's garage. Sir D...( whole have a slice off the rear and a salad please) Of O. Do deep fried potatoes count at a vegetable? And I did have pickles and onions. So, yes! 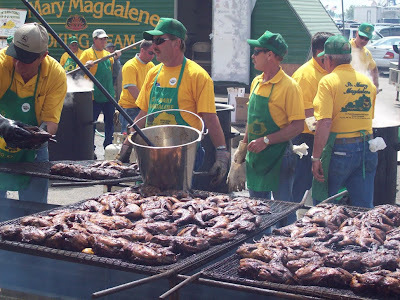 Bluegrass, Bar B Q, Elvis and Giant Rats...doesn't get any better than that! 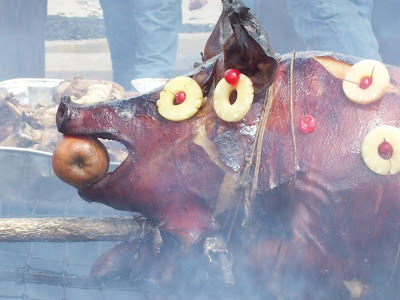 I love the Bar B Q in this area, but I'm also fond of how they cook pig in Hawaii, on hot rocks buried under the sand....YUMMY! No veg here Sir D...unless you want to get shot! Ah yes, a good time was had by all - except maybe the pigs, sheep and chickens. Just look at all that "Hunka, Hunka Burning Meat." As for Elvis, well the poor guy is like one of those trick birthday candles that keep re-lighting after being extinguished. 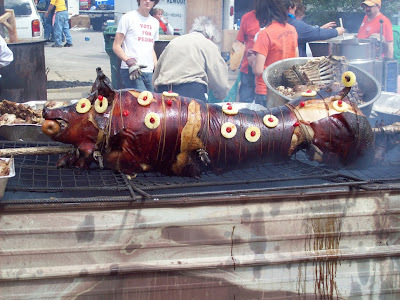 By the way, fuits and vegetables should only be used for decoration (see the pig on the spit). If we were meant to actually eat them, why would we have vitamin pills? this way, we could unpick the thing and see what its blueprint shape is like , and start making them ourselves. ..........also...what's the betting the rodent is a perfectly legal Capybara, which, under the terms of the 1902 Trades Description Act, is; and i quote the eminent Zoologist Sir Basil Montcrieff ...."a Frickin' Giant Rat"